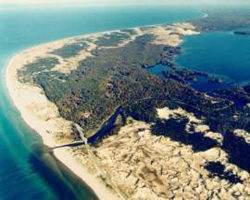 One of Michigan's most popular state parks, the Ludington State Park is comprised of nearly 5,300 acres of scenic sand dunes, ponds, marshlands and forests. It is situated between Hamlin Lake and Lake Michigan with several miles of shoreline and beaches on both bodies of water. Located within the Ludington State Park is the Big Sable Point Lighthouse and the Great Lakes Visitor Center. Note: Some map locations are approximate. Please call the venue at 231.843.2423 for exact directions.